I want to talk a bit about investing money held in trust. You've already learned about trust funds in What Is a Trust Fund? as well as gone through many of the benefits and drawbacks of using trusts to gift investments to your heirs in the many articles found within The New Investor's Guide to Trust Funds. Now, let's get into how the money within the trust is actually put to work. What Kind of Assets Can Be Owned When Investing Money Held In Trust? Unless the trust instrument - the document that governs the behavior of the trust - specifically permits or forbids certain investments, as a general rule, a trust fund's capital can be invested in any asset that would be consistent with the fiduciary duty the bank trust department or another trustee owes to the beneficiary or beneficiaries of the trust. 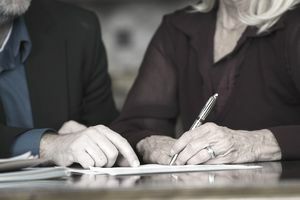 In many situations, the trust originally consists of assets accumulated by the grantor / settle in the case of inter vivos trust funds or, if he or she has passed away, his or her estate in the case testamentary trust funds. For example, when singer, songwriter, producer, and performer Michael Jackson died, many of his publishing rights, copyrights, song rights, and another intellectual property was put into trust for his children and family members. The passive income created by the assets in these trusts should allow his kids to remain financially independent for the rest of their lives. Wealthy farmers sometimes leave farmland in trust for children who are too young to operate it, the trustee hiring tenant farmers to take care of the land and share in the crop sales, with the kids taking possession upon reaching a certain age. In some cases, investors or executives who accumulated a large position in a blue chip stock will transfer some of the shares to a trust for family members, allowing them to live off the dividend income. In still other cases, all of the worldly asset left behind in an estate are sold directly or put up for auction so that the proceeds can be invested in a diversified portfolio of stocks, bonds, and/or real estate. It's not even particularly unusual for controlling interest in a private operating business, such as a manufacturing plant, to be held in trust in the case of entrepreneurs who want to ensure their spouses or orphaned children, who aren't involved in the company, are able to live off the fruits of their labor without ever borrowing against their shares, in which case a spendthrift trust is particularly handy. Do you plan on having the trust retain all of its dividend, interest, and rent income for many years, perhaps even decades? This is common when a child is a minor and you don't want payouts to begin until later in life. If that is the case, you are going to want to invest the money held in trust in a way that minimizes taxes because trust funds have what are known as compressed tax rates. That is, it doesn't take much to reach the top marginal tax bracket. This may include prioritizing ownership of stocks that don't pay dividends or tax-free municipal bonds. Do you plan on maximizing distributions in the most tax-efficient manner? If the recipient is in a lower tax bracket, it might be wise to prioritize ownership of high yielding dividend stocks as the beneficiary may be exempt from dividend taxes entirely depending upon his or her household income thanks to recent changes in the tax code. Do you want to keep control of a specific operating asset or holding in the family, such as the aforementioned farm or manufacturing business? In a case like this, you could have the trustee hire management to run the asset, then instruct the trustee to pile up any cash income in Treasury bills. I saw a situation like this once. A middle-aged business owner had an affair with a young employee. A love child resulted. The father died while the child was still a minor. He had transferred his assets to a trust fund and paid the local bank trust department to watch over his affairs until his daughter's 18th birthday, telling them to pile up money in the meantime from whatever dividends the business produced. At the time the daughter turned 18, she could either instruct the trustees to sell the business, adding to the cash they had been accumulating for her, and walk away with the money, or take possession of the business. This had the effect of ensuring the money stayed in his child's hands while the woman with whom he had an affair, the child's mother, was never able to access any of the wealth. If you are setting up a trust fund, the actual process of investing money held in trust isn't that difficult. You will need the trust instrument and documents proving the creation of the trust. Additionally, in many cases, you will need a tax identification number you've received from the IRS to track the trust's tax filings, which it is required to file each year just like a person or corporation would. The trustee, acting on behalf of the trust, then opens a bank or brokerage account in the trust's name and uses the account to acquire property. Depending upon the specifics of the trust, the trustee can either manage the money himself or herself or outsource the investment of the money in the trust to a qualified professional, such as a registered investment advisor. Smaller trusts are probably going to hold things like index funds or other mutual funds while larger trusts are likely going to be individually managed accounts that invest directly in securities rather than through pooled structures with, perhaps, the exception of an allocation to private equity funds or hedge funds. For a family trust, you could open a trust fund account at a brokerage firm such as Charles Schwab. Depending upon the restrictions in the trust instrument and documents, it would otherwise look like a normal brokerage account. It could buy stocks. It could purchase mutual funds. It could trade ETFs. It could hold REITs. You could open the trust account directly with a mutual fund company such as Vanguard. Vanguard charges effective all-in fees of 1.57% on a $500,000 trust invested in its underlying index funds and other mutual funds. This is a very reasonable for the service if you need a limited touch trust that invests in plain vanilla assets. Provided it is permitted, you could even go out, use the trust's checking account, and write a check to acquire a hotel or apartment building, making sure the title was registered to the trust itself. Of course, it'd make more sense to form a limited liability company to acquire the properties than to have the trust own the membership units of the LLC but that's a different discussion for a different day. The point is, investing money in a trust isn't much different than investing any other type of money insofar as you're talking about the problems of asset allocation, making decisions about market timing, systematic purchases, or valuation-based acquisitions, ensuring ample diversification, and focusing on tax efficiency. The key is to make sure you don't run afoul of the restrictions that may be set in place in the trust instruments.